Cars line up behind a stopped train in San Marco. First steps are underway with a $35 million federal grant application to update the city's aging freight rail infrastructure. If successful, the improvements could lead the way to restoring a passenger station at the Prime Osborn for the first time in over 40 years, potentially bringing Amtrak, Brightline, and commuter rail downtown. Could it work? JTA, along with the City of Jacksonville and the Florida Department of Transportation have applied for a $35 million federal grant through the Consolidated Rail Infrastructure and Safety Improvement program. The project, supported by CSX and Florida East Coast Railway, would restore the city’s rail and signaling infrastructure, particularly on the FEC corridor. 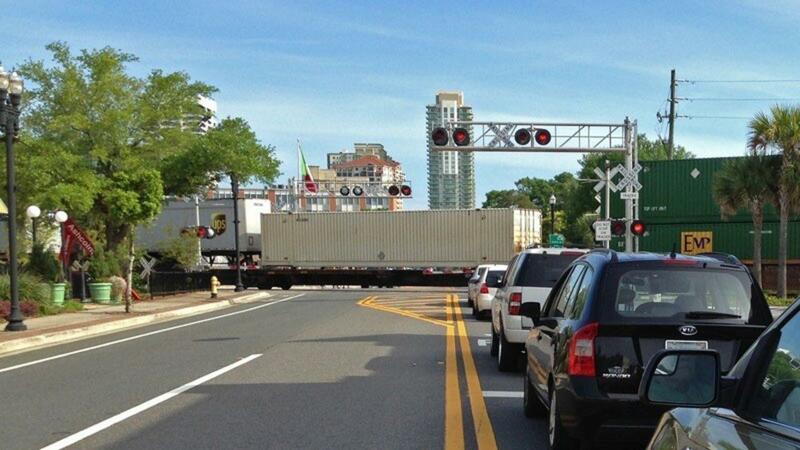 If successful, it would fix San Marco’s freight train chokepoint problem. Ever since Amtrak’s move, the city has sought ways to bring trains rolling back to the Prime Osborn. Since the 1990s this vision has been paired with the dream of establishing a local commuter rail service. In addition to providing a new transit option, commuter rail is well known for its potential to spark development near stations, two things Downtown Jacksonville could desperately use. While commuter rail has never gotten much past the conceptual phase in Jacksonville, at the August 2018 board meeting, JTA CEO Nat Ford told the Jacksonville Business Journal that commuter rail at the Prime Osborn is a specific goal of the grant bid, though a JTA spokeswoman has since said no specific plans are being made at this time. The grant bid comes amid a period of significant growth for both JTA and LaVilla. In the private sector, four apartment complexes are under construction or recently completed in the area, while JTA is currently building the Jacksonville Regional Transportation Center directly across from the Prime Osborn. Scheduled to open in 2019, the JRTC is planned to house city and intercity buses, bus rapid transit, and the Jacksonville Skyway monorail in one facility. Adding a train station to the mix would make for one hell of a transit complex. All this energy fulgurating through LaVilla isn’t lost on the city. An Urban Land Institute panel urged the city to pull out all stops to make a train station happen, and JTA is partnering with the Downtown Investment Authority for a series of public meetings on the future of the district. 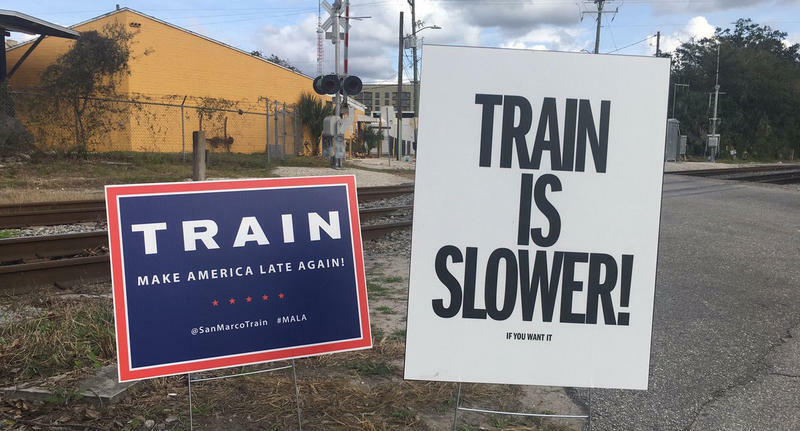 As it has been in many cities, passenger rail could be transformative for LaVilla and Downtown. Brightline operates high-speed intercity rail service between Miami and West Palm Beach. Plans are underway to extend the system to Orlando and Tampa. Florida East Coast Railway, which owns the mainline tracks that run through Downtown and San Marco all the way to Miami, is supporting JTA’s grant bid. This is intriguing in the fact that FEC is under the same corporate umbrella as Brightline, the country’s first privately-owned passenger rail system since the 1980s. Brightline runs trains between Miami and West Palm Beach, with plans to reach Orlando, along the FEC corridor - the same corridor that JTA hopes to restore in Jacksonville. Though it’s been little reported on locally, Brightline has made no secret of its desire to expand to Jacksonville and beyond. As Brightline has sparked millions of dollars of development with each station, bringing the system to Jacksonville’s transit complex would be a huge boon for Jacksonville and Downtown. The project would also open up possibilities for Amtrak, which currently doesn’t use the FEC tracks through Jacksonville. New infrastructure could be the catalyst needed to return Amtrak to its rightful place in the Prime Osborn. If successful, JTA’s project could ultimately bring commuter rail and two intercity systems to Jacksonville’s transit center. The Consolidated Rail Infrastructure and Safety Improvement grant is highly competitive. Though JTA can make a great case for its project, there’s only $318 million to go around, and Jacksonville alone would need $35 million of it. It’s a big ask. And years of planning would be necessary before any passenger service came online. But regardless of whether the current application is successful, it’s positive to see city agencies starting to rail seriously. For decades, rail investment has been deferred, treated as a future initiative for an unspecified later date, while other cities have planned and established rail systems in the same amount of time. As such, Jacksonville has missed redevelopment opportunities that have come to peer cities like Charlotte, Orlando and Salt Lake City. JTA’s bid is a sign that Jacksonville is moving in the right direction to establish a long-term vision for passenger rail. 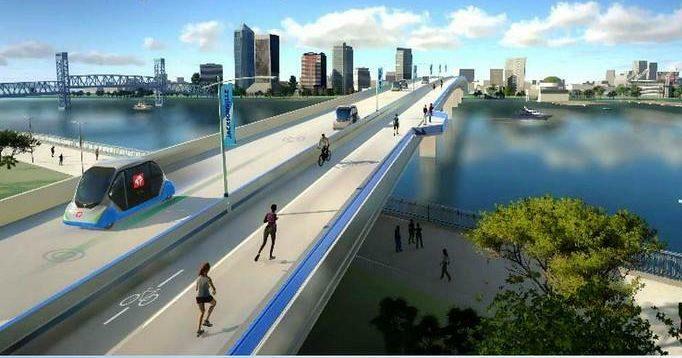 As we’ve known for a while, JTA is planning to expand its Skyway monorail service farther into some neighborhoods adjacent to downtown Jacksonville, with a proposal calling for automated, driverless vehicles.